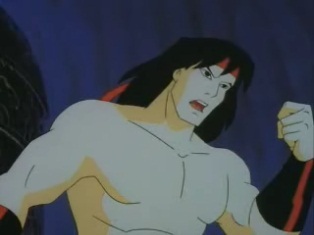 The rift has appeared, and Nightwolf finds out that it is in some mountains in Tibet. 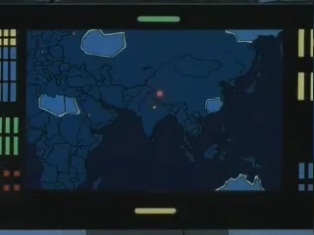 Raiden looks at the location on a map and says that there is an ancient burial ground in those mountains, but it is built into the side of those mountains like a fortress. 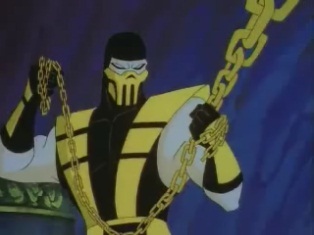 If Scorpion takes it before they do, he can hold it indefinitely. 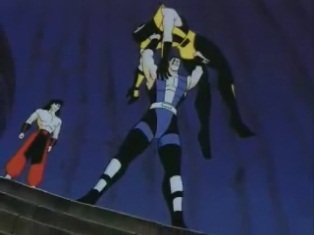 Stryker says that if Scorpion does do that, they can just keep him pinned down in it, but Raiden says it isn't that simple. He'll explain on the way. 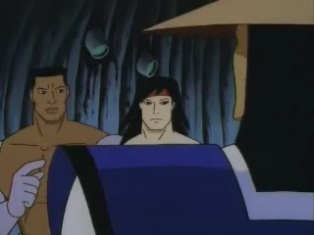 Jax is surprised -Raiden is going to be coming with them for once? 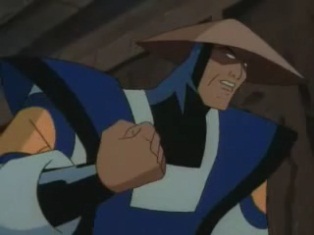 Raiden tells him to give him a break, he knows that he can't fight their battles for them. 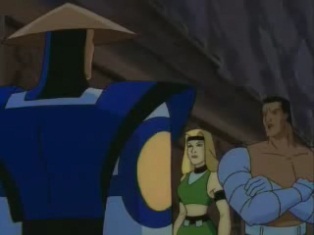 Sonya wants to know why, but Raiden tells her he'll draw her a diagram one day when they aren't about to be invaded by outworlders. 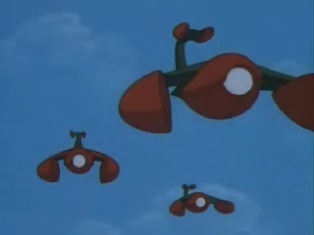 But for now they need to learn how to protect themselves. 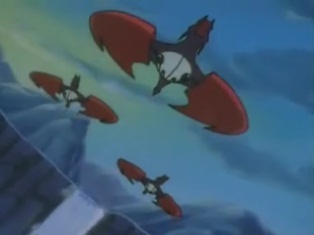 The team leave the room and are soon in their dragon jets. 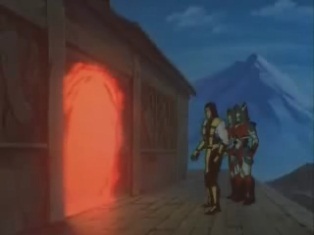 Raiden warns Liu Kang that there may be a dimensional portal hidden in the tombs, if Scorpion reaches it he may be able to invade several other realms. 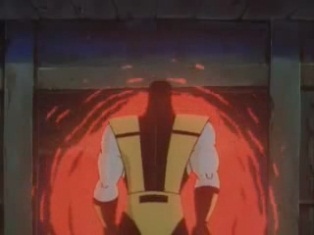 The reason Earth is seen by certain outworlders as a prized possession is because of these portals. Kitana says that in her realm, these things don't exist, but here on Earth, the planet is like a waystation between all other dimensions. 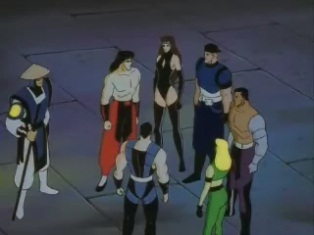 Liu Kang isn't listening and Kitana asks what's up. 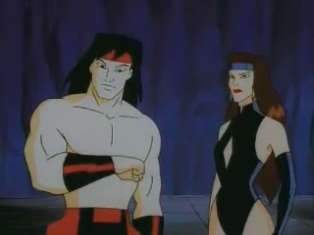 He says how he might not have beaten the original Sub-Zero if it weren't for her, so facing Scorpion, another ninja from the same clan, is troubling him. 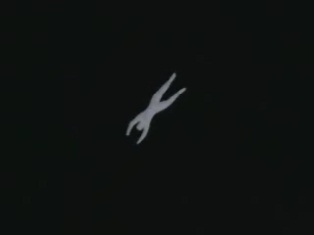 She tells him that he must overcome his self-doubt, as that could be a far greater enemy than any living being. 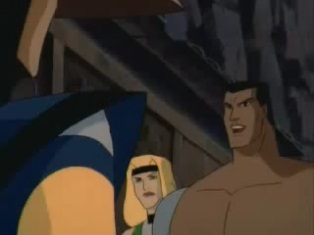 Meanwhile Stryker asks Sub-Zero about Scorpion's past. 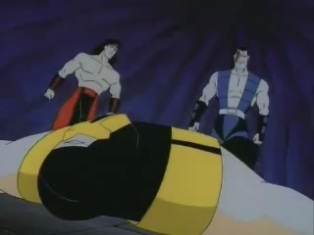 Sub-Zero reveals that Scorpion died in battle, and his spirit tried to seek refuge in the realm of the honored dead. 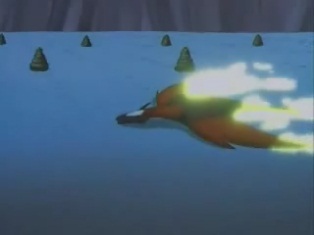 But that realm refused him as his demise was without honor, and his spirit ended up being sent to the realm of lost souls. 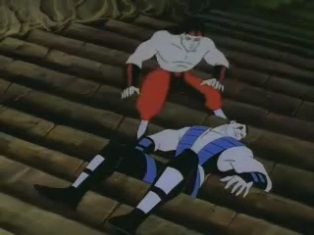 Scorpion's spirit refused to die. 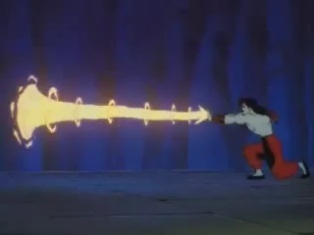 Scorpion decided that he would not rest until he had had his revenge, and absorbed many of the souls in the realm to increase his own power. 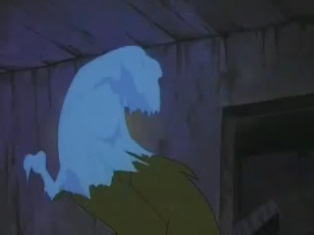 He has now returned to the living as a walking dead. Back in the present, the team are soon nearing their destination when more aircraft appear: Scorpions! 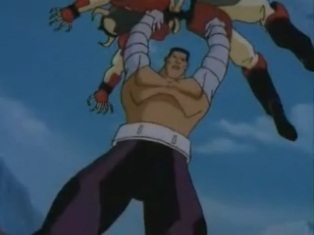 The team manage to take most of them down, but one gets behind Jax and Sonya's jet and get a hit on it. Their jet crashes but they both survive and get out. 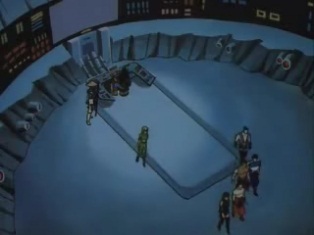 Some of the Scorpion jets land or crash, and the pilots get out -and the pilots are skeleton warriors! 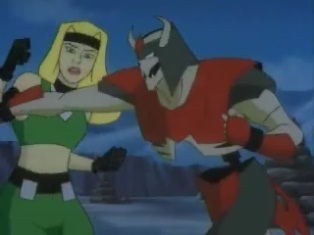 They start to fight Sonya and Jax. 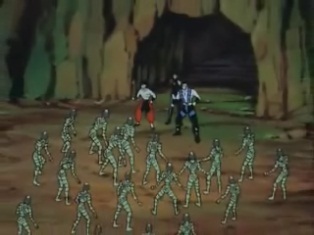 The skeletons aren't that tough, but then Scorpion himself appears with more warriors. 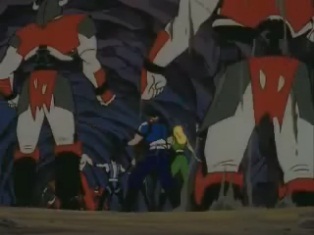 He tells his troops to obliterate the enemy, whilst he starts to walk off towards a temple. 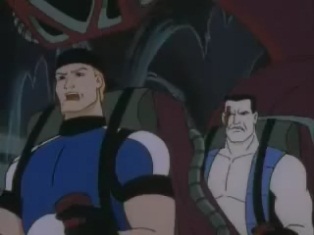 The other two dragon jets land and as the skeletons approach, Sub-Zero and Stryker take them out. 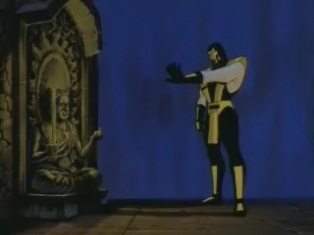 Whilst this is going on, Scorpion has reached the temple. 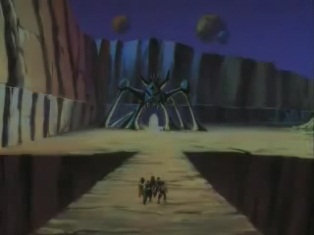 As the front door opens, a portal is revealed, and Scorpion sends two of his skeleton warriors through it. 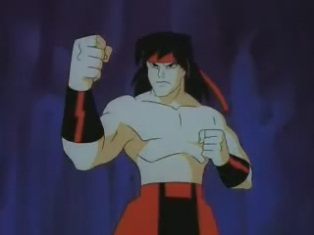 He then turns around and calls out to the souls of darkness, the dishonored dead. 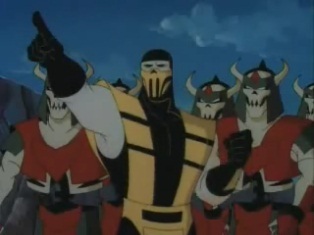 Soon Scorpion has even more troops at his command, this time in the form of mummy-like beings. 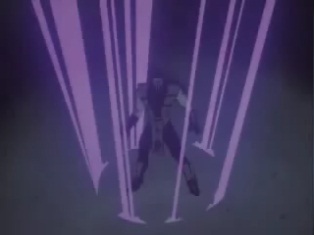 He says that he will go from realm to realm, making his army of dead rise. Then, he will rule over the living. 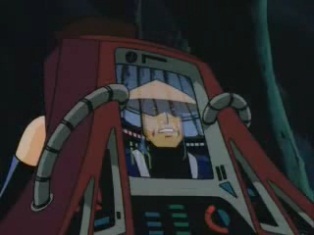 He gets his mummy troops to go through the portal. 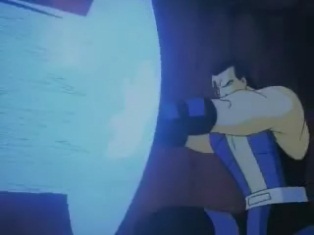 Scorpion then also goes through the portal. 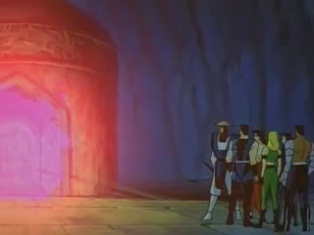 The team arrive at the temple and Sub-Zero wants to go through the portal also, but Liu Kang stops him, telling him to think first. Raiden then appears and says he isn't happy -one impossible to kill ghost ninja is bad enough, but a whole army of the undead is even worse. Jax asks "oh so unhelpful one" what the next move is. 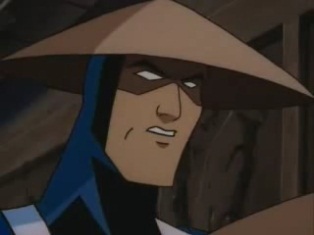 Raiden says that Scorpion and his army should be in the realm of lost souls, so the team need to get their enemies into a portal, then he can deal with the rest. 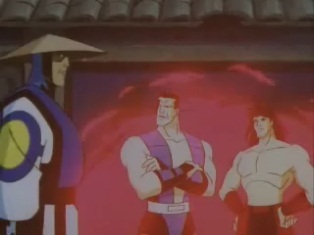 The team think Raiden has once again got the easy part, but he tells them they need to act fast, before Scorpion raises every corrupt corpse from every realm. 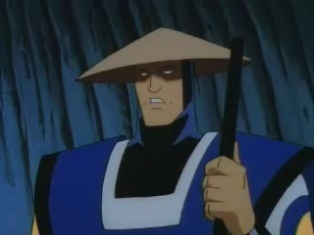 He'll probably hit the outworld first -and Raiden is powerless in that realm, so they're on their own. 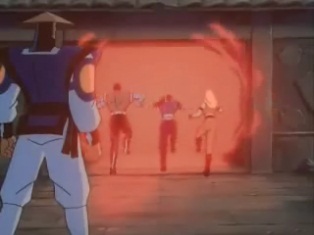 Sub-Zero says they are wasting time, so the team heads through the portal. 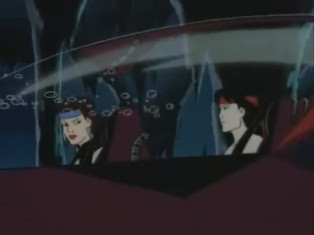 They are soon in the outworld, a place where they have no allies, and Kitana is in great danger. 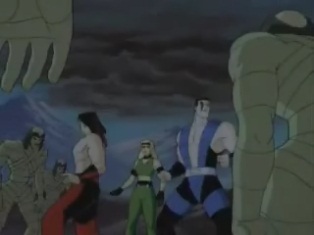 The Emperor, Shao Kahn, would love to kill the rightful heir to the throne of the outworld. 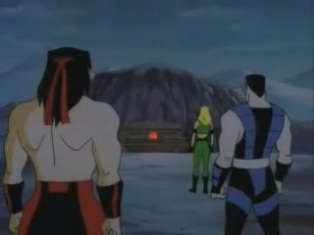 Sonya suggests they hurry and find Scorpion before word reaches Shao Kahn or one of his Generals about their visit. Kitana says Scorpion is here to ravage the graves of the dishonored, who do not share the same burial grounds as the other dead. 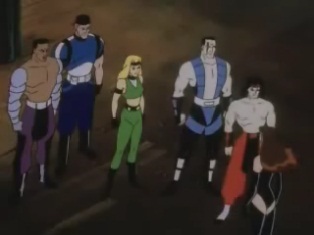 She says she can lead the team to where Scorpion should be, but warns that they will be taking a path dangerously close to Motaro's region. Kitana leads the way and says that this place has been her home for 10,000 years, but looking at it now, the lands are badly ravaged. 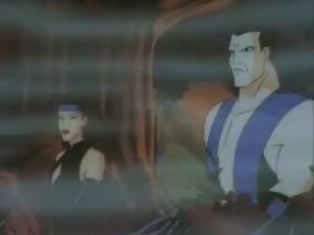 Sub-Zero says Earth is their realm now, but she says she can never feel totally at home there. 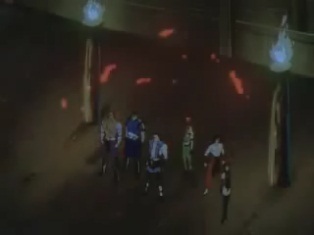 The team reach their destination, and Kitana says that all kinds of evil souls are kept here, such as Shang Tsung's soul. 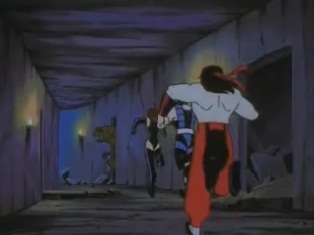 The team move inside, but don't get very far when some skeleton warriors rise up out of the ground. 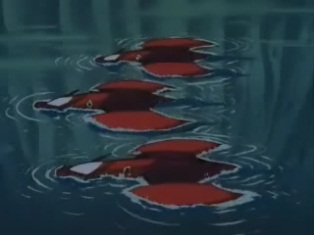 ...and the creature is no longer a problem. 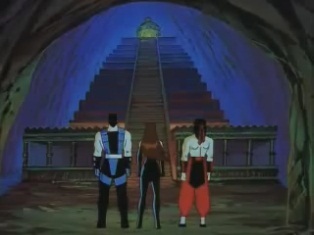 The trio keep running until they come across a structure at the top of some steps, and Kitana says this is it. 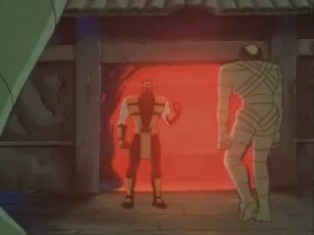 They can see Scorpion climbing up the steps, but before they can chase after him, many mummy warriors appear. 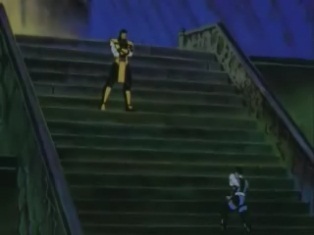 As the trio fight them off, Sub-Zero knocks down all the opponents near him and then goes after Scorpion by himself. 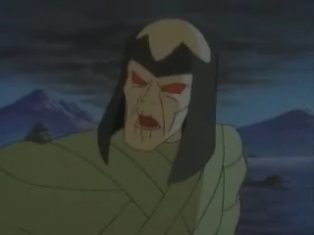 He apparently has a grudge against him for things he did to his clan, but Scorpion says that he cannot keep him from his prize -the most evil of all souls, the soul of Shang Tsung. 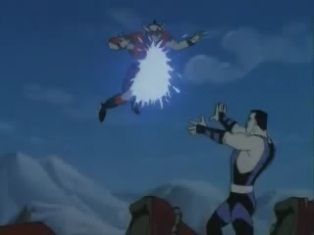 Sub-Zero is determined to take him down and attacks, but his leaping punch is avoided and Scorpion hits him with a flying kick. 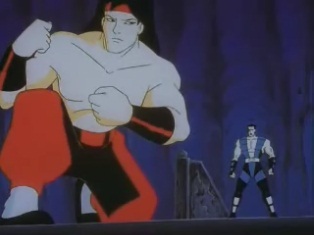 As Liu Kang appears, Scorpion says that neither of them are man or ghost enough to stop him. 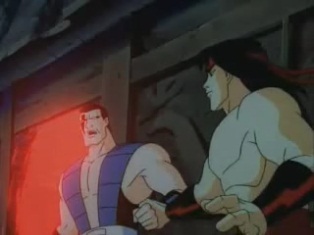 As he walks away, Sub-Zero tells Liu Kang it is down to him now. 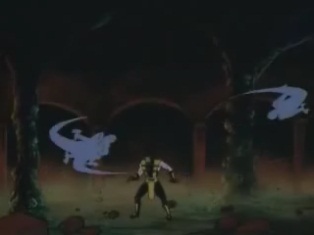 Scorpion is about to revive Shang Tsung when Liu Kang appears and challenges Scorpion to Mortal Kombat. 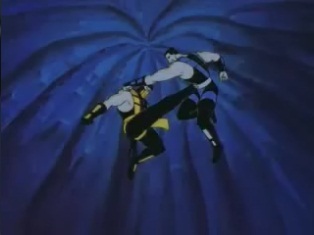 Scorpion says he is no match for him and uses his spear move so Liu Kang can GET OVER HERE. 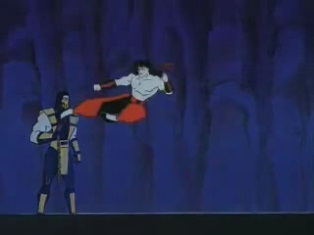 As he gets Liu Kang in rage, Scorpion hits his opponent in the stomach with a powerful uppercut. 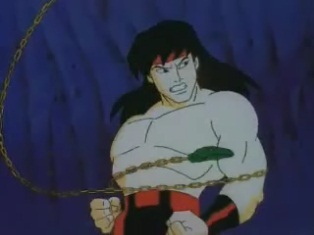 ...and then throws out a low fireball which hits Scorpion and stuns him. 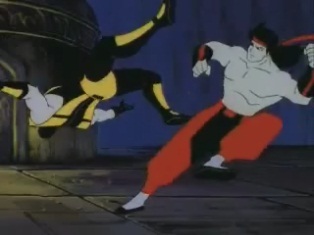 Liu Kang then does another flying kick, only this one hits and sends Scorpion flying. 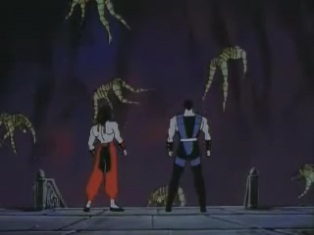 Liu Kang and Sub-Zero see that he has been defeated. 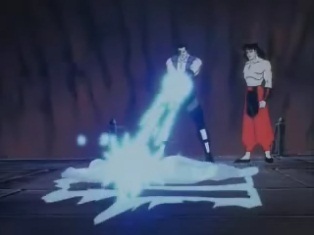 Sub-Zero is going to finish him off, saying that he is finally going to get what he deserves, but Liu Kang says that without honor, he is not better than his brother. 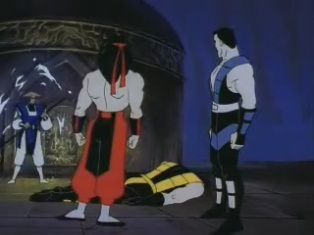 Sub-Zero puts Scorpion down, just as Raiden appears and says that Scorpion has got himself a one way ticket to the realm of lost souls. 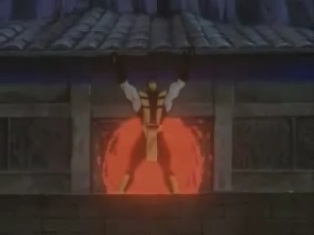 Sub-Zero freezes Scorpion's body and pushes it through a gap, where it falls before vanishing in a flash as Raiden teleports it. 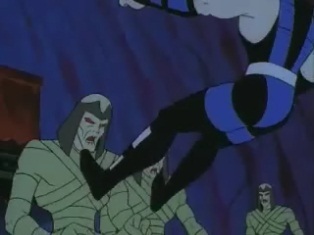 Raiden then gets the bodies of the mummy warriors to levitate up to where they are before sending them back to the realm where they belong. 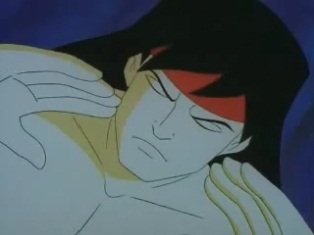 This episode has is the only one not to have been released on DVD in the UK, so I've had to get images from a Youtube upload of it, hence the worse image quality. 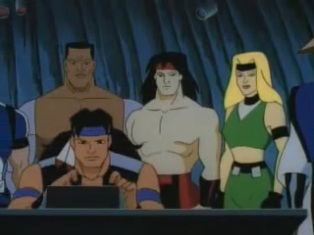 When Sonya, Jax and Stryker start fighting the skeleton warriors in the cave, the song "Deeper Down" by Sister Machine Gun plays. A little later on, Psykosonik's "It has Begun" track plays. 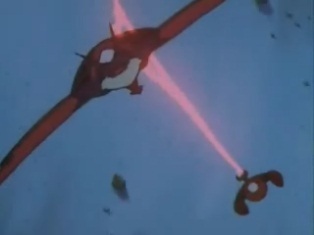 This is the only episode to feature these tracks.